Everyone has lots of bits of yarn left over from projects and they get put into a bag under the stairs or into the attic and forgotten about. Well now is the perfect time to get them out and sort them into plys, colours etc and make yourself a throw for the garden chair, a picnic rug or a blanket for the caravan. 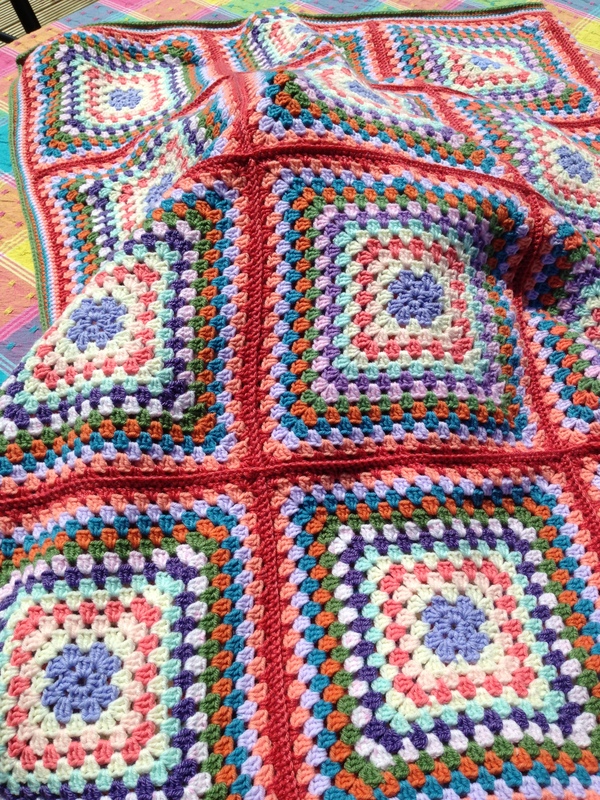 This blanket was made with 14 different colours of Sirdar snuggly DK left over from lots of projects over the years. It doesn’t have to be the same make or even the same ply, just experiment and see what happens. I had all these in a box and just pulled one after the other out and crocheted a granny square and was so delighted with the result that I did another 23 squares and made a single bed sized blanket! I did have to add to this to finish it but I did also use up a huge quantity of my stash so I didn’t mind having to get more. It is just a basic granny square made up of 14 rounds of trebles and joined together with double crochet and round the edge I finished it off with 14 rounds of double crochet. Retro and vintage are all the fashion at the moment so not only will you turn your spare yarn into something beautiful you will also impress your friends with top fashion accessories!! 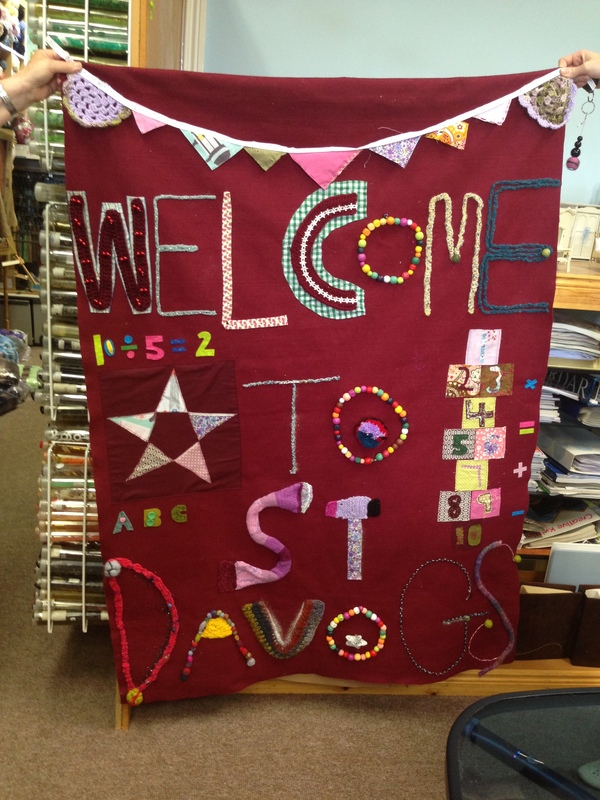 Welcome to St. Davog’s School, Belleek!! Isn’t this an amazing welcome to any school? Made by the children for every visitor to Belleek’s local Primary School. With a little help from Maria and Grandma’s Attic the children have produced this masterpiece that includes knitting, crochet, patchwork, decoupage, beadwork and felting skills. Maria has been going into the school for 2 hours a week over the last 8 weeks to teach and assist both boys and girls all these skills. I think a huge round of applause for all concerned and hopefully it will remain in pride of place for many years to come. Maybe if they get a visit during the G8 convention the leaders of the world will admire it and take some ideas back home with them!! a fantastic sale that is running throughout the summer. Use this brilliant offer to start your Christmas Knitting early. 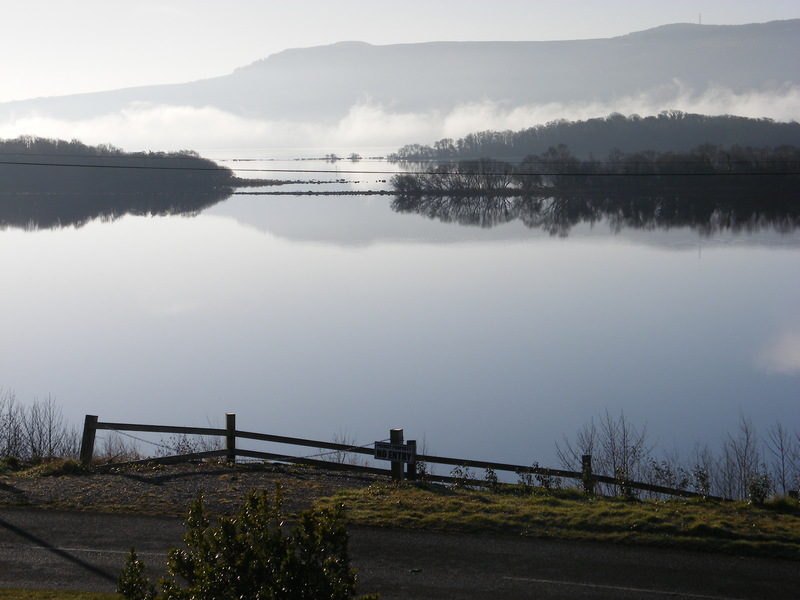 I am interested to know how many and whereabouts any knitting groups are in and around County Fermanagh. A customer from Omagh was sharing her group’s activities with me this morning and it sounded wonderful. Like us they do a lot of charity knitting, including knitting for the fish and chip babies in Africa. They knit for each chosen charity for 3 months and then change to another. This is a brilliant idea and means the knitters don’t get fed up knitting the same things all the time. Use this blog to share your experiences and charity ideas. We are always happy to pass on to others what we are doing and also where we send things too. This can be a real problem as not all hospitals for example will take premature baby items or small dolls or teddies for A & E departments. If you are knitting for Africa they prefer dark colours, not pastel so it is wise to check before you knit anything. There are plenty of causes that are more than happy to take hand knits and will gladly tell you exactly what is needed. Many ladies, and I am sure a few men, would like to join a group but don’t know how to go about it. Many customers say they would love to come here but live too far away. It would be great to know of other groups that I can put these customers in touch with. Not only do you all do great work but it is a fantastic way for people to meet like minded people, forge new friendships, combat loneliness and depression. It keeps your mind active and your mind busy. A small contribution to cover cost of tea and biscuits is a great idea. If you need to buy extra wool then it can come from this kitty and if, at the end of the year, you have any money left then a treat for yourselves is a great idea. As a treat we recently invited a local herbalist to come in and make creams with the ladies. A great afternoon was had by all and the best thing was it cost the ladies nothing. Everyone went home with a pot of cream specifically designed for them and the cost for the day came out of the kitty. To get started put a notice up in the local post office or local shop for donations of any odds and ends of wool. Nearly every house has a ball of left over wool that will never be used!! Good luck ladies and I look forward to hearing from you. If you prefer you can call me and leave your group name, day of meeting, time etc and I will pass it on to any relevant customers. 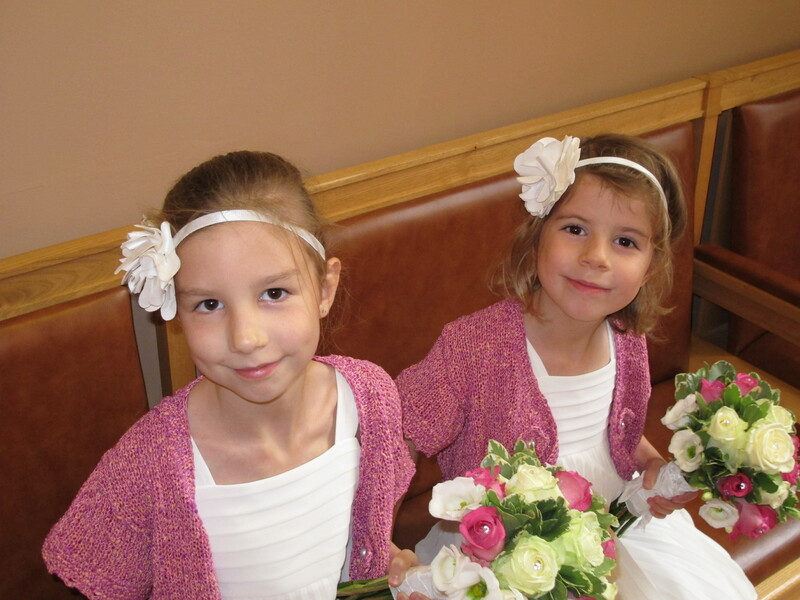 Jasmine and Ava attend Grandma’s wedding in hand knit bolero’s. Introducing the other two of Grandma’s beautiful granddaughters, Jasmine and Ava. Here they are pictured at Grandma’s wedding wearing lovely pink hand knitted boleros made with Gedifra Barina yarn. I am not sure if this yarn is still available but it was perfect on this occasion. They were made using big needles so grew very quickly and to make them even simpler I crocheted an edge all around and added simple crochet flowers on either side of the front instead of buttons and buttonholes. Nice easy design that can be worn over a fancy dress or with a pair of shorts in the summer. Every Wednesday a group of women join me at Grandma’s Attic for a coffee and a knit. 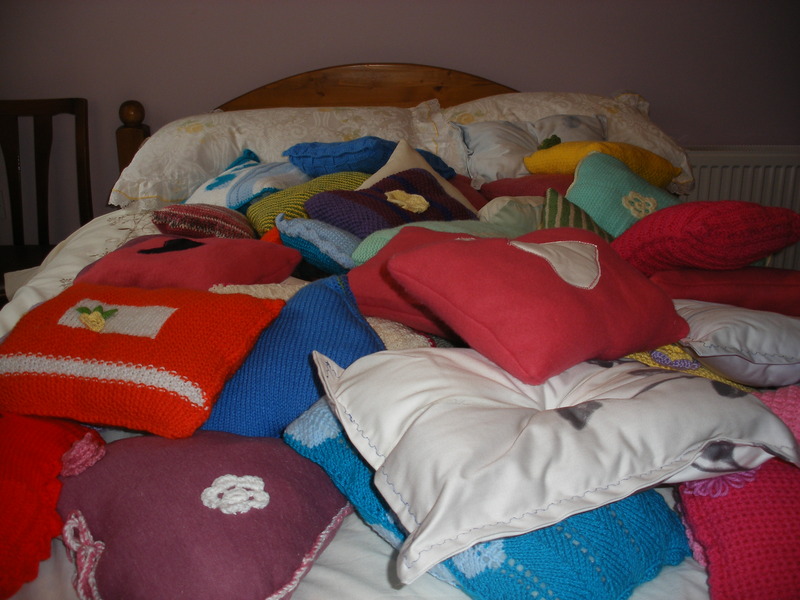 These cushions are a sample of approx 400 cushions we have already sent to the Belfast Royal Hospital to aid patients who have undergone heart surgery. The feedback from staff and patients has been amazing and I wanted to share it with you. Patients who received a cushion on discharge showed a quicker recovery rate, less depression and a more positive outlook for the future. This may not seem to be much to anyone who has never undergone major surgery but for anyone that has it is a huge hurdle to get over and every little helps. 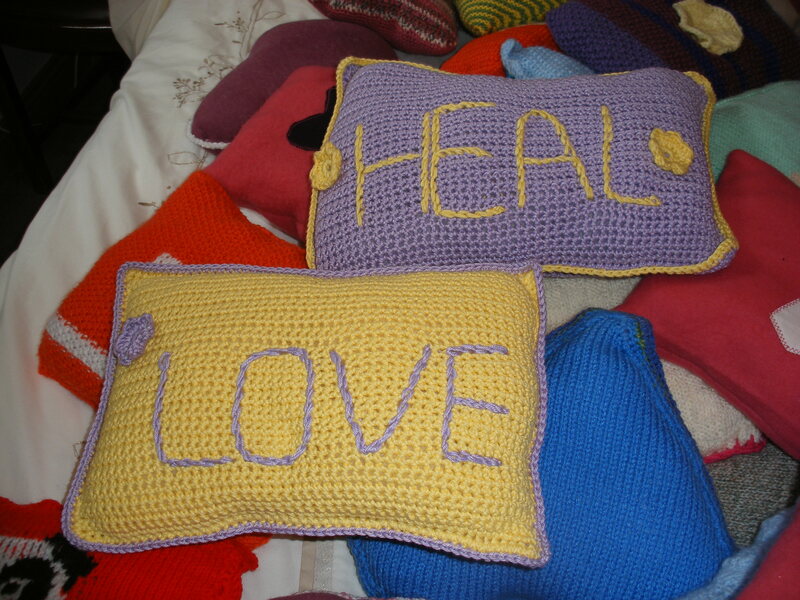 I don’t know if it is the actual cushion that aids healing or just the fact that someone who doesn’t actually know you, took the time and trouble to make something just for you and that raises the spirit and aids recovery. I will leave that to the experts to decide. The physical cushion is used to protect the wound from the seatbelt in a car for example (the wound can take up to 6 months to heal completely internally) or for holding close to your chest for support when coughing or hopefully, laughing!! As you can see we have a real mix of styles and colours. We try to cater for Men, women and children. Different sizes for different people. There are about 1000 open heart operations carried out every year and it is our aim to provide every one of those people with a cushions to take home and keep. No official research has yet been done with regard to these cushions but it is something that specialists are looking at because of this feedback. If anyone wants to help us or indeed a hospital local to you then I would be happy to offer advice about how to go about this.